Learn clinical hypnosis skills or sharpen your existing hypnosis skills, to improve patient outcomes and add to your professional toolkit. Workshops meet accepted Standards of Training in Clinical Hypnosis. Each workshop offers 20 CEs and is co-sponsored by The Institute for Continuing Education. Instructors are Donald Moss, PhD, Saybrook University, Eric K. Willmarth, PhD, Saybrook University, and Carolyn Daitch, PhD, Center for the Treatment of Anxiety Disorders. SCEH workshops and conferences consistently garner highly favorable reviews from attendees, are scientifically-based, and include demonstration and an opportunity to practice skills learned. Whether you are new to hypnosis or experienced, you will walk away from our Midyear Clinical Hypnosis Workshops with new insights and skills you can use in your practice immediately. HOTEL: A discount rate of $99 at the Radisson Hotel Albany has been arranged for attendees. Learn or sharpen Clinical Hypnosis skills to improve patient outcomes and add to your professional toolkit. Join SCEH and APA Division 30 in April in Albany for introductory or advanced training led by global experts in the hypnosis field. Topics are: Intro/Basic: Introduction to Clinical Hypnosis and Advanced: Power Tools for Anxiety and Affect Regulation Integration of Hypnosis, Cognitive-Behavioral and Mindfulness Interventions in Clinical Hypnosis. Workshops meet accepted Standards of Training in Clinical Hypnosis. Each workshop offers 20 CEs and is co-sponsored by The Institute for Continuing Education. Instructors are Donald Moss, PhD, Eric K. Willmarth, PhD and Carolyn Daitch, PhD. Whether you are new to hypnosis or experienced, you will walk away from our Midyear Workshops with new insights and skills you can use in your practice immediately. SCEH invites submissions for its upcoming Annual Conference. The 2018 Annual Meeting of the Society for Clinical and Experimental Hypnosis will celebrate the place of "Hypnosis in Integrated/Integrative Healthcare: Collaborative, Connected and Creative Approaches" as our conference theme. Our 2018 meeting will highlight the expanded integration of hypnosis into medical and mental healthcare settings. In addition, the meeting will showcase the collaboration between hypnosis practitioners and complementary healthcare practitioners. 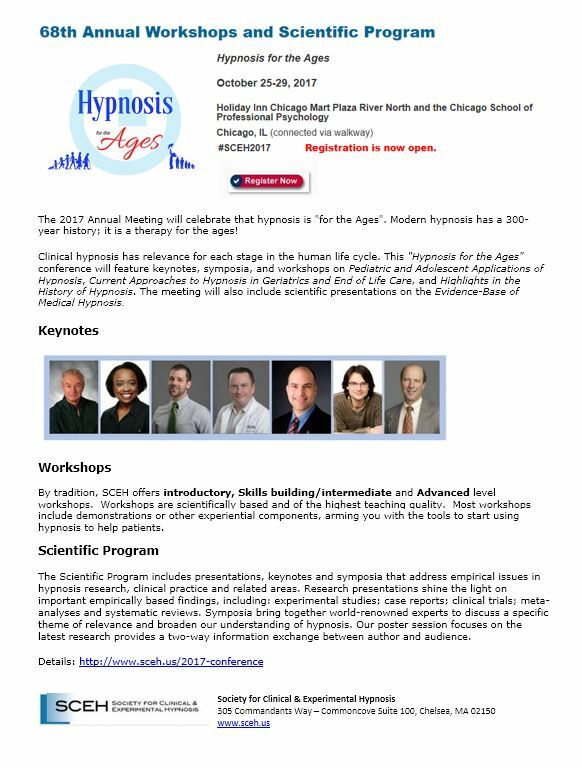 The meeting will also include scientific presentations on the "Evidence Base of Clinical Hypnosis." Proposals addressing the meeting theme will be prioritized. As announced our September newsletter, SCEH is expanding the educational opportunities we offer and introducing a new Midyear Workshops event in 2018, an initiative that came out of our strategic planning efforts. The program is being co-sponsored by Division 30 of the American Psychological Association, and we hope it will help grow awareness and membership in both organizations. The Mid-Year Workshops will take place from April 20-22, 2018 (Friday - Sunday) at the Radisson Hotel Albany, Albany, NY. The Advanced Workshop will be a wonderful program by Dr. Carolyn Daitch on Power Tools for Anxiety and Affect Regulation: Effective Integration of Hypnosis, Cognitive-Behavioral, and Mindfulness Interventions. Drs. Don Moss and Eric Willmarth will present a 20-hour Basic/Introductory Workshop in Clinical Hypnosis that is consistent with the Standards of Training in Clinical Hypnosis and partially meet SCEH Certification training requirements. Please see below for more details on this initiative. Workshops are offered at both the Introductory and Advanced level. These workshops will be led by experts and leaders in the field. Join a world class faculty and your colleagues from the mental health and medical communities in Chicago this fall. For more information about the hotel please see Site and Accomodations. We are seeking nominations for SCEH Awards for 2017. As a member of the Society, we hope you will consider making a nomination. DEADLINE: All nominations are due by July 15th. Every year, the Society for Clinical and Experimental Hypnosis presents a number of awards to distinguished individuals in the world of hypnosis to acknowledge their service and scientific and clinical contributions to our field. We seek nominations from SCEH members and the general community of clinicians and researchers working with hypnosis. Our goal is to encourage the the widest breadth of nominations. 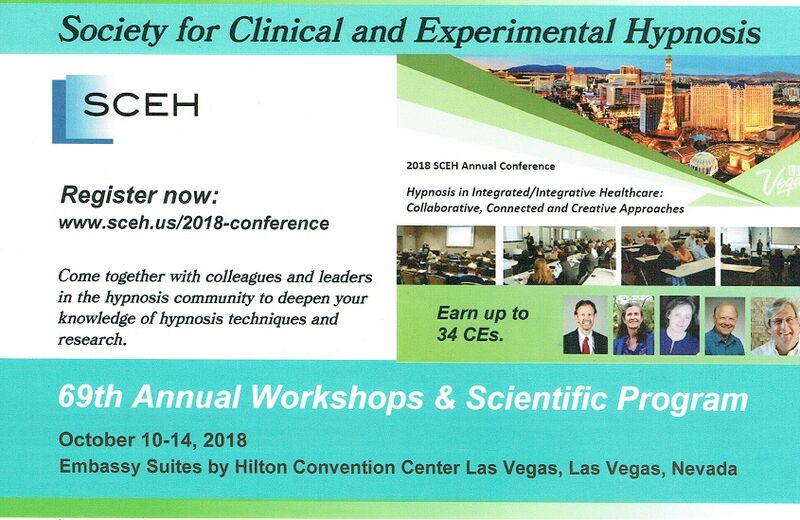 You still have time to submit your abstracts for presentation to 68th Annual Meeting of the Society of Clinical and Experimental Hypnosis.